It seems to me as if these beautiful regions answer literally to the description of the land of promise, a land flowing with milk and honey. By 1834, the Osage Tribe had been convinced to move to a reservation in Kansas. Following this period, it has been suggested that Owen Park was the location of a Creek settlement called Big Springs Town. After the Civil War, the Osage were relocated back to the land which is now Osage County. 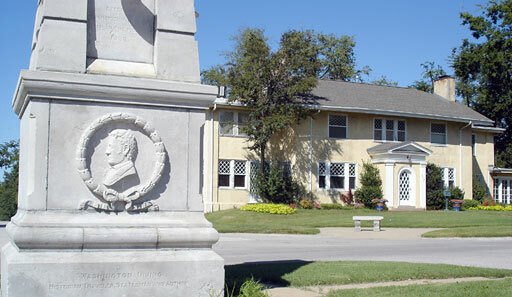 The point where the three great nations of the Osage, Cherokee and Creek joined is commemorated by a monument in Owen Park. In 1882, the railroad was on the way from Vinita across the Verdigris to the Arkansas River. Owen followed the railroad grading work, hauling a large tent. He used the tent as a boarding establishment. With beef and produce from his farm, he supplied hundreds of rail workers, including James Monroe Hall and his brother, Harry C. Hall. James was in charge of the railroad contracting company and Harry was one of the contracting suppliers. Although the Hall brothers are considered to be the founders of modern Tulsa, Chauncey Owen was already in the boardinghouse business at the nearby riverbank. After pitching the company store tent near the future terminal site on that summer evening in 1882, the Halls made their way to Owen’s tent to sample his wife’s home cooking. Owen immediately moved his tent boardinghouse near the new terminal location, and soon after began to build the first hotel in Tulsa. The six-room wood frame building was also Tulsa’s first two-story building. Appropriately named the Tulsa Hotel, it began business in the winter of 1882. The hotel was managed by Owen until 1890 when it was leased and renamed the St. Elmo. In 1892, Owen leased 80 acres of his wife’s Creek land to J. P. Goumaz, who built a home at Brady Street and Santa Fe Avenue. Around 1895, the Goumaz family planted 7,000 peach trees, an apple orchard, strawberry fields, and established a large concord grape vineyard from the top of the hill east to Quanah Avenue. Some remnants of the vineyard are still evident on alley fences. Chauncey Owen’s wife, Martha, died in 1902. Her heirs received an allotment of 160 acres from the Creek Nation, which encompassed the present Owen Park and neighborhood. In the early twentieth century, the lands of Owen Park were often used for public events, even before the park received official designation. Fourth of July celebrations took place there, with firework displays entertaining crowds who sometimes numbered in the thousands. One explosion on Saturday, January 23, 1904, however, was unplanned. The Western Torpedo Company of Chanute, Kansas, had about 875 quarts of nitroglycerine stored in a magazine building built in a little ravine. Used for shooting oil wells, this highly explosive substance was so unstable that railroads refused to handle it. The torpedo company had it hauled by wagon from Kansas. An unfortunate worker by the name of McDonald, apparently a substitute for a regular employee, was last seen about 4:00 p.m. going into the magazine with a load of things from the wagon. Fifteen minutes later a tremendous detonation shook the countryside. The terrible blast broke the door locks at Dr. Sam G. Kennedy’s country estate a quarter mile north. It stunned workers at the brick plant 800 yards away, and shattered glass in the business district one mile east. The boom was reportedly heard as far away as Claremore. When the dust settled, the previous location of the magazine was a great crater, and all that was found of McDonald could be fit into a shoe box. McDonald’s legacy was, perhaps, that he helped prepare the site for the future Owen Park Lake. Following the discovery of oil in the summer of 1901 at Red Fork, Tulsa began to rapidly grow and prosper. Owen wanted to divide and sell his land, but at over an acre, there was scant public interest. Perhaps he believed he could capitalize on the growing recreational movement in the country. He offered more than twenty acres of park land to the city. In March of 1909, the city held its first Park Commission meeting and, by August 18, 1909, decided to purchase the land for ,500. The decision met with criticism due to the land’s price and distance from downtown. In those days, many considered it to be too far out in the country. Most were placated, though, when it was announced that a streetcar line would be run to the park, running west on Archer and turning north on Rosedale to Easton Boulevard. Owen Park officially opened on June 8, 1910. Also in 1910, the city sold five acres of the park land to the nearby Tulsa Vitrified Brick Company, located at the southeast edge of the park. Owen attempted to prohibit the sale. He contended that the brick company would “excavate large quantities of earth which will make a dangerous hole for the accumulation of water and the production of sickness…” and would be a “detriment to the health and comfort of the citizens.” He lost an appeal to the State Supreme Court, who held that the deed did not specify that the land would be used for park purposes only. Owen’s concern proved to be prophetic when a young lad drowned in the abandoned brick pit in 1954. The city soon moved to repurchase and fill the pit. The reclaimed property was again added to the park. In 1913, the ravine in Owen Park was dammed to create a small lake which was used as a city swimming pool, although “swimmin hole” was probably a more appropriate name. In spite of annual efforts each spring to line the pond with sand hauled by wagons from Sand Springs, it was never long before rains and usage negated those attempts. The muddy bottom, however, did not detract from its popularity. The major problem occurred when bathers, jumping from the twelve-foot tower, sometimes missed the diving hole. Lifeguards would then be called upon to rescue victims stuck in the mud. During the winter, the lake served as a skating rink. Its use as a swimming pool continued through the 1920s. Today, bathing and skating are prohibited, but fishing is a popular pastime and the lake is home to a thriving population of ducks and geese. By 1915, the neighborhood was growing rapidly. The boulevard had been paved and the Irving monument was dedicated on April 30th. An advertisement in the Tulsa World on July 4th announced that, “Lots are going fast in Tulsa’s most beautiful residence suburb—Irving Place and Park Hill.” The oil boom that had made many wealthy also provided abundant jobs for a burgeoning middle class. New homes were in high demand and residential construction progressed rapidly. By the end of the 1920s, the lots were filled with homes ranging from craftsman bungalows to estate mansions. Schools had been built in the neighborhood. In 1918, Pershing Elementary was built on the hilltop and, in 1926, Theodore Roosevelt Jr. High was built on eight acres of land adjoining the park on the south. The Owen Park District was placed on the National Register of Historic Places on September 9, 1999. It was listed under National Register Criteria A and C, and its NRIS number is 99001137. Cultural Resources in the Tulsa Urban Study Area, by Kelly C. Duncan, edited by Annetta L. Cheek, Archaeological Research Associates Report #14,1977: Irving Monument, p. 43; Pioneer House, p. 46; Owen Park Neighborhood, p. 42.